Warrior Shayla Currin wins the barrel racing event, and teammate Matt Mundell the steer wrestling, as the rodeo concludes Sunday. Walla Walla Community College crowned two individual rodeo champions during Sunday’s final-go in College Rodeo Riding Against Child Abuse action at the Walla Walla Fairgrounds indoor arena. A Dayton cowgirl, now riding for the Warriors, came into Sunday’s 10 a.m. start leading the barrel racing field by .32 seconds. Shayla Currin’s first go run of 14.30 led the field, with Blue Mountains’s Tiffanee Lewis second in 14.62. Currin was fifth out, and started with the left barrel, the only contestant to start left, and covered the indoor course in 14.47 to post the top time of the Sunday go. 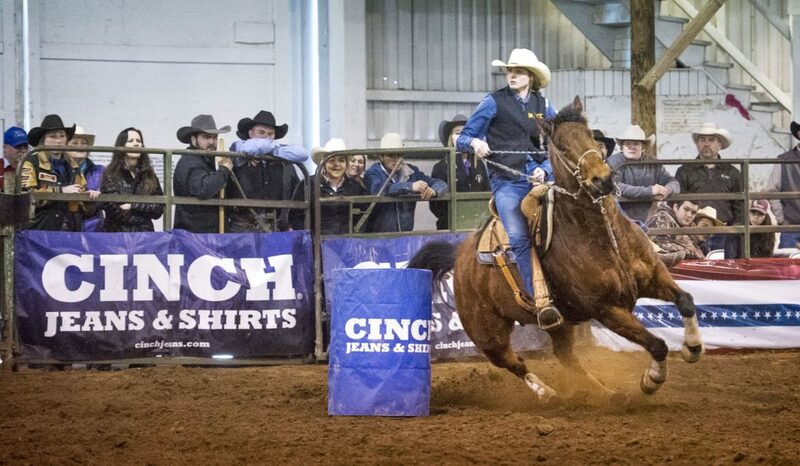 Combined with her 14.30 first go run, Currin posted the best time of the rodeo with a 28.77 on two runs. Emily Sorey’s 29.34 on two runs was a distant second. “I had a good weekend,” WWCC freshman Currin said as she introduced her horse. “This is Luke. He is a horse we (the Currin family of Dayton) raised. This was his first rodeo, so I wasn’t sure how he would handle the pressure, banners and crowd. He seemed to work out alright. Warrior cowboy Matt Mundell came into the Sunday’s steer wrestling round fourth, having had a 6.9 run on his first head. Mundell got his steer to the ground in 6.0 to tie the fastest time of the rodeo and picked up a check for fastest time of the Sunday go. Mundell then took the rodeo title as the three cowboys ahead of him failed to get their steers on the ground. The rough stock won the Sunday go. Warrior Hall rode his saddle bronc to the whistle, but failed to spur out of the chute and got no score. The winner of the event, Treasure Valley’s Jack Bentz, was dumped by his Sunday saddle bronc, but won the rodeo on his ride of 60 in the first go. The only contestant in bull riding, Blue Mountain’s Clay Hall, almost got to the whistle before being bucked off by his Sunday bull, posting a score of 77 on his one good ride to win the rodeo. Preston Pederson from Blue Mountain won the Sunday go in tie-down roping with an 8.9 run and won the rodeo with a 17.7 on two. Warrior Lexis Andrade led a contingent of Warrior cowboys from Hawaii with a 12.3 Sunday run and posted a 24.4 time on two to place third. The Warrior cowboys and cowgirls will march on to Milton Freewater in the middle of April for their next step toward reaching the National Collegiate Final in Casper, Wyo., in June. In addition to the rodeo action, the Exchange Club and WWCC, once again, put together a weekend to raise awareness and funds for the fight against child abuse. Barrel Racing: 1, Shayla Currin, WWCC, 28.77 avg; 2, Emily Stone, EORU, 29.34 avg; 3, Janey Reeves, UID, 29:38 avg; 4, Tiffanee Lewis, BMCC, 29.37 avg. Breakaway Roping: 1, Danyelle Williams, EORU, 6.9 avg; 2, Janey Reeves, UID, 9.5 avg; 3, Jaimie Jo McLaughlin, WWCC, 16.9 avg; 4, Joely Patnode, WWCC, 24.8 avg. Goat Tying: 1, Janey Reeves, UID, 15.4 avg; 2, Jacy Leach, WWCC, 18.9 avg; 2, Tommi Swannack, WWCC, 18.9 avg; 2, Karleigh Robinson, TVCC, 18.9 avg. Steer Wrestling: 1, Matt Mundell, WWCC, 12.9 avg; 2, Kolby Currin, BMCC, 15.0 avg; 3, Jayce Garthwaite, WWCC, 24.6 avg; 4,GW Clark, TVCC, 40.1 avg. Tie Down Roping: 1, Preston Pederson, BMCC, 17.7 avg; 2, Jordan Tye, CWAU, 18.5 avg; 3, Lexis Andrade, WWCC, 24.4 avg; 4, Wade Bruemmer, CWAU, 28.7 avg. Bull Riding: 1, Clay Hall, BMCC, 77 Saturday go, No score Sunday. Saddle Bronc Riding: Jack Bentz, TVCC, 60 Saturday go, No score Sunday; 2, Hayden Hall, WWCC, 35 Saturday go, DQ Sunday. Team Roping: Lindy Lehman & Garrett Springer, 15.5 avg; 2, Candida Eldridge & Rayna Longeway, 27.6 avg; 3, Jacy Leach & Jayce Garthwaite, 29.4 avg; 4, Julia Reeves & Lauren Leyva, 39.7 avg.